Exquisite polystone statue of the Iron Hill Dwarves. Inspired by The Hobbit: The Battle of the Five Armies. Measures roughly 15-inches long x 12-inches wide x 11 1/2-inches tall. Edition size is a mere 750 pieces! 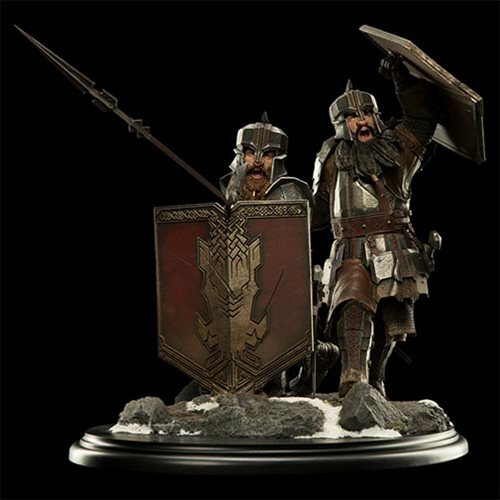 From the inimitable Weta Workshop, comes this exquisite polystone statue. With an edition size of a mere 750 pieces, it measures roughly 15-inches long x 12-inches wide x 11 1/2-inches tall. 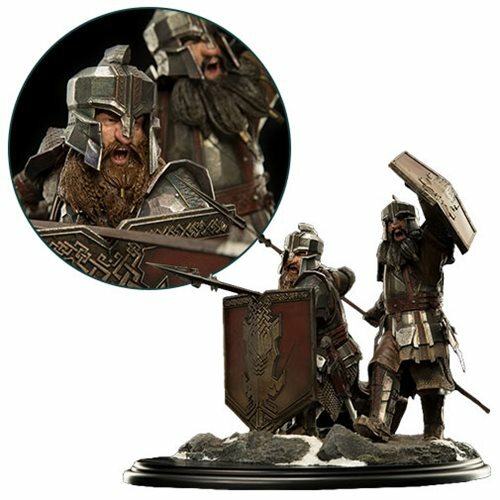 The Hobbit: Iron Hill Dwarves 1:6 Scale Statue inspired by The Hobbit: The Battle of the Five Armies is designed to accompany the The Hobbit: Mirkwood Elf Soldier Statue (sold separately) to create one dynamic scene straight out of that film. Proud, grim-browed folk, the Dwarves marked every past slight or injustice visited upon them by the haughty Elves and arrived spoiling for a fight. 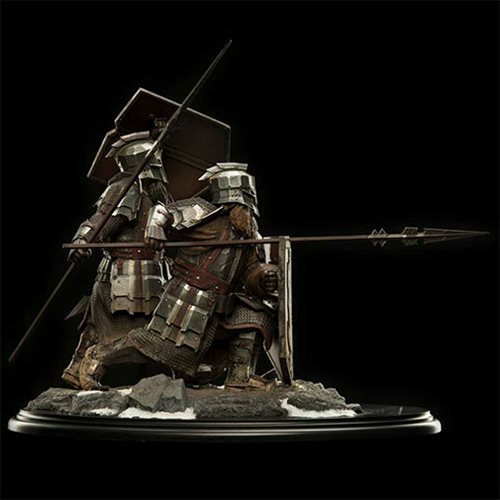 Though stout, the soldiers of the Iron Hills were resolute and tireless fighters. Dwarf armor was thick and their shields broad. Beyond the axes and short swords that hang from their belts they carried long pointed spears to extend their reach and impale charging foes. With the army of Mirkwood encamped on his doorstep in The Hobbit: The Battle of the Five Armies,Thorin Oakenshield sent word to his kin in the Iron Hills that they might march with haste to defend his claim to the treasure of Erebor. Under the banner of his cousin Dáin II Ironfoot, a host of steel-clad Dwarves answered Thorin's call, pressing on through the night to surprise King Thranduil's Elves. Yet in the face of a much greater evil, the resentment simmering between Elves and Dwarves was swiftly set aside, for the armies of Azog came suddenly upon them, erupting from the ground to make war upon the mountain. Reforming their ranks, two hosts locked in enmity moments ago now fought as one - a force united by the love of life and liberty, standing against the onrushing tide of savage Orcs!